She's an amazing crier, she's so natural. Gahh Great's smile made me go crazy when I watch their lakorns together lol. Oh I loooooved them in this lakorn. Matt had me crying. Happy to know that Thippy gonna subbed Pleng ruk pa bpeun taek after YK ended..Even though I watched it countless time already but still so freaking happy that someone going to sub it..Miss Porshe&Sammy mak mak, they need to reunion soon!!! he looks good with glasses..
i still don't want to believe he is the killer.it hurt me >_<..
i still want jaemyung to survive but when i put myself in the families that had lost their member i just wish he get fair trial and sentence.i want him to reunite again with dalpo. It was sad and depressing, and then it got really sad and dark right before the end, and then it ended happily with hope. I thought Alex and Taew were really cute together. the depress scene make me stay with the drama.don't like much the romance. yeahhh me too..I'm addicted to the story line more, I wonder how the writer will make a good ending at the end since there are so much twist already..
yup,so many twist.the one that i waiting most is when in ha mother learn her lesson.she has destroy dalpo childhood life so really want to see how she will be. James and Yam were both rumoured in RDG.Maybe Nong will wait for them lol. Yes, they both came out to say that they are just brother and sister now, nothing more. I remember they still dating while Sammie filming with Porshe.. But after she finished filming, I read an interview where Sammy said so herself that they are no longer dating. She made it clear that there's no chance of them heading down that road again. They're just pee nong gan now. They may hang out with each other and go to places together, but not as a couple, just friends. He's funny. I like him not because he reminds me of Rain but because he's hilarious lol I also like him with Sara too. They totally need to reunite! I became an instant Cherry fan after that lakorn lol. OMG, I still need to start on the drama, hahaha. @Hanajungupup You're welcome ja ^^ I totally agree! Yeah, Pop and Yam reunion indeed. 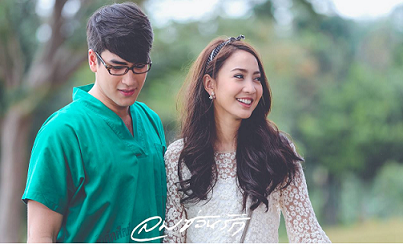 They were uber cute in their lakorn :) But yes, I hate that Ch3 downgraded her too. She's improved over the years... give her another chance!! aissshhhh!